There are only 17 days left until the official start of spring! Is your wardrobe ready? If it’s not, don’t panic, because Guess Handbags is offering you the chance to win a $1000 shopping spree. That means stocking your closet with a new handbag (or two, or three!) for every occasion, along with current styles from the latest collection. Need we say more? Enter to win now! Eighty-One Cross-Body ($81) For the cool downtown girl, a sleek bag with zipper, stud, and chain detailing is on-point for a girl's night out. Wild at Heart Bucket Bag ($89) Come festival season, this slouchy boho-bucket bag hybrid will become your go-to. Girlfriend Satchel ($128) This roomy bag in an of-the-moment pastel hue has weekend brunch written all over it. Merci Petite Crossbody Flap ($65) From sightseeing excursions to that after-hours cocktail party, this bag can, and will, go anywhere. Merci Large Box Satchel ($128) This feminine take on the doctor’s bag works overtime as a mini weekender. Swap your work tote for a structured satchel that’s roomy enough to hold your daily essentials and more. 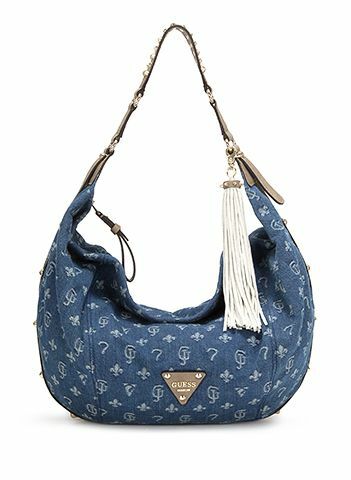 La Vida Logo Hobo ($118) The questions is: where wouldn’t you wear this bag? Simply put: it’s the kind of bag that works hard and plays hard, too. Rock Geo Hobo ($108) This fuss-free shoulder style will come in handy when running errands around town. Trixia Uptown Satchel ($128) Braided handles lend a luxe look to this go-anywhere satchel. Road Trip Hobo ($108) Studded detailing easily takes this bag from day to night.